“Colas et Colinette”, written in 1790 by Joseph Quesnel (1746-1809), a Frenchman who had settled in Canada, is the first original piece of music theatre composed in North America. Yet it was Godfrey Rideout’s reconstruction of the work in 1963 that made it and Quesnel known throughout Canada. Quesnel’s only other surviving work “Lucas et Cécile”, also an opera, was advertised for production in 1808 but never performed. 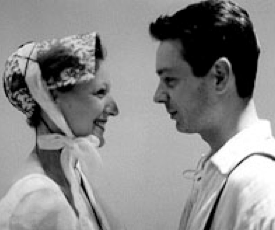 Like the earlier work, “Lucas et Cécile” is a “comédie mêlée d’ariettes” (comedy interspersed with songs). What Rideout did for “Colas” in the 1960s John Beckwith had done for “Lucas” in the 1980s. The only problem was that, while the complete libretto had survived for “Colas”, “Lucas” had only its “ariettes” but no “comédie”. At this point enters the small independent opera company, Opera Anonymous, to commission a libretto from Brad Walton, known for his witty prologues to performances by Opera Atelier and for the cult opera “The Loves of Wayne Gretzky”. This English version with aria translations by Alexander Wiebe had its world première at the Glenn Gould Studio on May 25. It is a resounding success. Walton has created a lively and humorous context for those “ariettes” that should make “Lucas” as well-known as “Colas”. Walton has ingenious concocted a plot to make sense of the seventeen musical numbers of the surviving autograph score. In it he is true to the comic conventions and to the social concerns of the period. Like Catherine Johnson’s extraordinarily clever book for “Mamma Mia!”, Walton’s dialogue sets up the arias so naturally it seems more as if he has merely translated the original libretto rather than supplied a new one. Add to that its abundant wit and comic invention and one is convinced Walton has supplied the perfect foil for Quesnel’s little musical gems. Wiebe’s translations of these arias are so expert one would think they were the original texts. Walton’s plot is suitably simple. Lucas and Cécile are in love but her parents oppose their relationship. Cécile’s father, a rich farmer, is consumed with the notion of progress and believes his daughter’s only hope of rising in status is by marrying the educated grammar school teacher Du Sotin. To marry Lucas, a farmer who is illiterate and “imperfect of hygiene”, means Cécile and her children will never rise in the world. Needless to say, Du Sotin lives up to the central syllable of his name (“sot” = fool) and proves to be an egotistical dandy concerned not with love but Cécile’s dowry. Tenor Brian Duyn, a fine singer and good actor, was well cast as the down-to-earth Lucas. A few weak top notes aside, he made Lucas an ardent and thoroughly likeable fellow. The thinnish speaking voice of Marcia Bunston as Cécile gave no hint of her rich soprano that made one wish Quesnel (or Beckwith) had added more ornamentation to show it off. As Thérèse, Cécile’s mother, Nina Scott-Stoddart was a joy. Not only does have a lovely, clear-toned mezzo voice but she is an excellent comedian who immediately won over the audience. Though buffo baritone Ross Darlington playing the Mathurin the father, was fine in his singing, he was not word perfect in his dialogue, causing the the comic momentum of the work to falter. Tenor Shawn Henry, however, made Du Sotin, along with Thérèse, the most engaging character of the show. His posing and gestures, pompous and effete, told us his character before he said or sang a word. His reading of a ridiculous poem written about the sleeping Cécile, likening her bosom to milk and himself to a cat, was the non-musical highlight of the show. David Mosey was suitable grave as the headmaster who has found Du Sotin to be a fraud. Edward Franko’s unfussy stage direction always found the humour in the work without gimmickry. Conductor Kevin Mallon drew a fine performance from the 11-piece Aradia Ensemble with crisp rhythms and a beautifully blended tone. The music, as in “Colas and Colinette”, sounds much like very early Mozart, not profound but filled with pleasing melodies. To replace the absent overture, Aradia gave a lovely reading of the Symphonie op. 3, no. 4 by Johann Christian Bach, a contemporary of Quesnel. Matti Sevink designed the attractive costumes, exaggerated as might be expected for would-be “bourgeois gentilhomme” of a father, his wife and the pedant. Toomas Kilp provided the unobtrusive lighting. It would be sad after the fine work of Beckwith, Walton and Wiebe in resurrecting this charming opera if it should live for only one performance. Luckily, Opera Anonymous has announced that it hopes to tour the show throughout Ontario in the 2002-2003 season. As a blend of talent old and new, this Canadian confection will give you two hours of unassuming pleasure. Photo: Marcia Bunston and Brian Duyn. ©2001 Opera Anonymous.